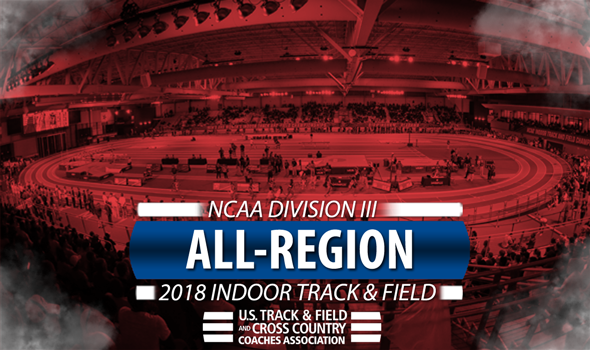 NEW ORLEANS – The U.S. Track & Field and Cross Country Coaches Association (USTFCCCA) has announced the All-Region honorees for the 2018 NCAA Division III indoor track & field season. The top-5 individuals in each event from each region earned All-Region distinction, in addition to each of the members of the region’s top-3 relays teams. The regions used for this award – Atlantic, Central, Great Lakes, Mideast, Midwest, New England, South/Southeast and West – match those used during the cross country season. A total of 772 honors were handed out to men’s athletes, while 781 awards were bestowed to athletes from women’s programs. There were two men’s teams with 20 or more honorees: Christopher Newport and North Central (Ill.). The Captains earned 23 mentions, while the Cardinals took home a gender-leading 26. Four women’s programs nabbed 20 or more mentions, led by George Fox with 24. Annie Wright earned five All-Region honors – 200 meters, 4×400, long jump, shot put and pentathlon – to pace the Bruins. Wright is one of just two athletes in NCAA DIII this season who earned five All-Region honors: UMass Boston standout Wadeline Jonathas is the other with top marks in the 60 meters, 200 meters, 400 meters, 4×400 and long jump. SUNY Geneseo had the second most honors for a women’s program with 22, while Emory and Johns Hopkins each had 20. A full list of honorees can be found below. It is sorted alphabetically by team and then alphabetically by athlete’s last name.